Stock #A120:IMMACULATE!!! Antique Style Engraved ring.....14K WHITE GOLD.... 2.25 CARAT T.W. RUSSIAN CZs.... Gorgeous hand-made piece!!! Beautiful, Hand-Crafted, top quality Jewelry workmanship!!!.... 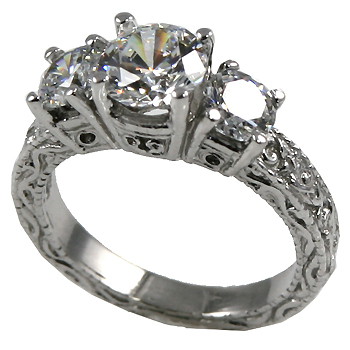 Very heavy ring, shank, & prongs... 1.25 ct center stone w/2- 1/2 ct side stones. Matching band A118 available.